I'm going to need a run down of some of the older guys, because I'm immediately thinking Edwards for third slot and don't know much of anything about most of the WRs - other than knowing the names of the big guys and assuming they were the best. Bios and "one man's take" will be out for next week, for now just putting out a starting list to generate discussion and see if I missed anyone. But I can say Rick House was the slot opposite Poplawski, and our top Canadian 3 times and tops in the league once. Wilcox was our go-to slot in the 90's and a 4 time Most Outstanding Canadian on the team (winning the league wide award once and being runner-up another time), and he also put up the second or 3rd best single receiving year in Bomber history (behind Stegall's 2002 and James Murphy's 1986 year respectively). Edwards was known as "Baby Milt" and quietly had some of the highest career numbers a Bomber has ever put up. For wide receivers, James Murphy was the greatest receiver we ever had and the guy who held every club record before Milt came along. Bud Grant led the league 3 times in receiving before switching to head coach in the 1950's. Pitts and Nielsen were 1960's and early 70's stars with multiple all-star nods and team awards. Holmes was the leader of the receiving corps in the Brock era. Boyd played second fiddle to Murphy in the mid-80's, and Gordon was the understudy to Milt in 2000-01 before Bruce came in. Be a shame not to include tight ends in this as we had some good ones in Ernie Pitts & Paul Markle. Just because tight ends aren't used anymore they deserve o be recognized as well. I suggest we vote for 3 receivers. Wideout, slot & tight end. The Bombers never had a tight end earn a divisional or CFL all-star nod from 1968 to 1980 when the league tracked that position, and Paul Marlkle had only 900 career receiving yards and 80 catches in his 3 seasons with the Bombers from 1970-72. Don’t think he makes the cut when stacked up against the Tony Gabriel’s of that era. But I will say that the “end” position of the 1930’s-1960’s that was the pre-cursor to the tight end position did produce some talent (Pitts and Grant should rightfully be placed there instead of wide receiver, along with Jeff Nicklin, Neill Armstrong, and Bud Marquand). So I will acquiesce and add an “end/tight end” category as well, with one starter and a second choice who can compete in the generic “5th receiver” spot. Our offence will now have 14 men on the field (sounds like a ‘Rider game). If you feel Markle deserves to be among the candidates, tell me which slotback to remove, since the tight end of the 1970’s was closer to a pass catching slotback of the 1980’s than a run blocking end of the 1950’s. I used Markle as an example. I don't know if he deserves to be there. I don't want to see Ernie Pitts lose out here. He was the best tight end in the CFL in the late 50's to mid 60's. I would have ranked Pitts as a strong contender for one of the top 3 wide receiver/alternate spots. Ernie Pitts played Tight End for the Bombers on offense. 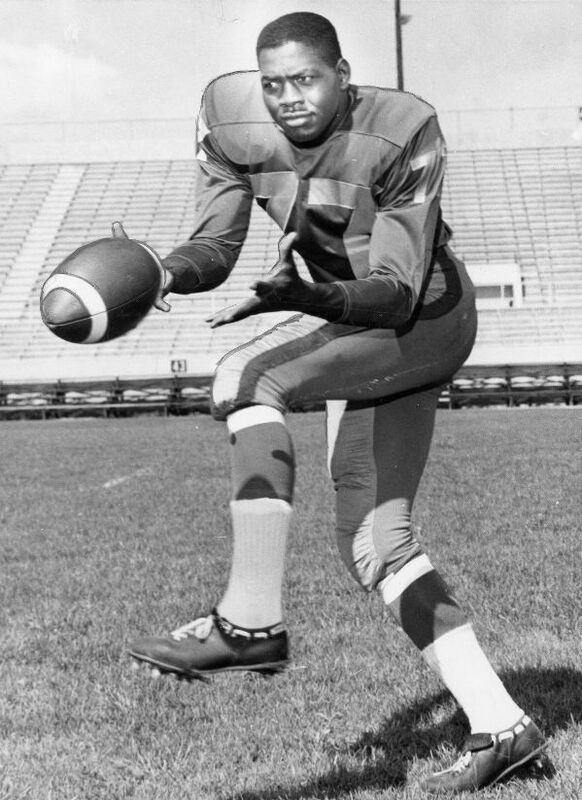 He switched to defensive back full time for the 1967 season & played there until the end of the 1969 season. He was traded in the off season to the Lions for the 1970 season but tragically was shot to death by his wife in September of that year during a domestic dispute in their Denver, Colorado home.